Congratulations to Paul Adams who won our Festive Archaeology Photography Competition with this beautiful photo of Avebury Henge. As part of the competition, ADS and Internet Archaeology will be publishing a festive archaeology photo every day for the 12 days of Christmas. From snow-covered henges, to Christmas jumper clad archaeologists and archaeology themed Christmas tree toppers, stay tuned to see our 12 days of Christmas....read more. As the popularity of depositing small archives via our new online deposition system ADS-easy has risen, we have come across a couple of examples where depositors have eschewed OASIS in favour of uploading a report to the ADS archive via ADS-easy. In terms of just depositing data with the ADS that is fine but not really the best practice, and more costly for depositors too! So how should it work? As part of the NEARCH project a call for proposals was published in spring 2014 by the Paris CENTQUATRE- and Jan van Eyck Academie for 10 artist residencies. Nearly 500 applications were received in total and carefully considered by the selection committee composed of the different partners involved in the implementation of these future residencies....read more. 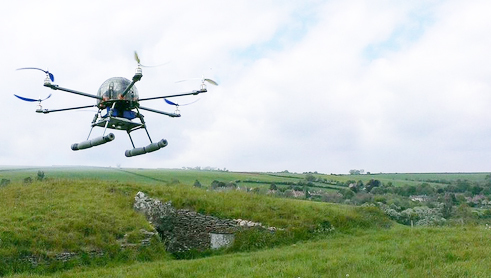 Last month the ADS released the new Guide to Good Practice for the use of Unmanned Aerial Vehicles (UAVs) for archaeology. UAVs are a 'disruptive technology', a technology that forces us to rethink how we do (or used to do) things, from protecting white rhino to delivering pizza. Everyone who needs a bird's eye view is now wondering how this technology can help them; farmers, structural engineers, ecologists and, of course, archaeologists....read more. Last month the ADS and English Heritage also released 84 very popular English Heritage Archaerology Monographs. Some of the country's most iconic heritage sites are represented including Stonehenge, Hadrian's Wall and York Minster, with subjects ranging from a Saxon bed burial to coastal fortifications; radiocarbon dating to an architectural history of English prisons. So if you havent seen them already there is plenty to explore.